For more information on having a safe trip drop by the web site of SAFE MEXICO. Research is half the fun of any vacation! And even better, research usually helps you will have a more enjoyable trip. Surfing the Internet, cruising the bookstores, and pondering over maps is a great way to start your vacation early and helps to get you through those last few nagging days at work. Some key items to research include 1) weather during the time of the year you want to travel, 2) the destinations that interest you the most, 3) your hotel options, 4) recreation options available, and 5) side excursions near your destinations. Other things you can research include the local culture and history, as well as some of the more popular places to dine out, cocktail and to experience the local people. Expectations are a huge part of any vacation, so the more you research your trip to Mexico, the more fun you are likely to have! Wherever you are going in Mexico chances are good that a friend, a friend of a friend, or someone that you know from work has been there. A brief conversation with someone who has been to your destination does two things. First, it gets you all fired up about going there because of all the great stories they will share with you! But even more important, they can share some of the secrets they learned during their stay in that corner of paradise. The hard part is the "conversation side trips" these folks go on when describing their trip. They are almost certainly going to give you T.M.I. (too much information), but it's all in good spirit so try to hang in there and listen. It probably helps if you start with a list of a few key questions that you are curious about, in an effort to steer the conversation. Even still, the ramblings have their value and you are certain to pick up some good information as they bounce from story to story. Just think...you'll probably be telling similar stories to somebody else when you return! For many years it was possible to visit Mexico without a Passport. And in some parts of Mexico is still is, such as along the border areas of Baja. Even as recently as early 2002 U.S. visitors to Mexico could get by without a passport if they had a certified copy of their birth certificate and a photo I.D, such as a driver's license. Mexican officials are now tightening up on this proof of citizenship issue, and may no longer accept a certified birth certificate and photo I.D. in some locations. The airlines usually have the most recent information on the requirements at the destinations they fly to, so contacting them is a good first step. If you need further verification you can call the Mexican Consulate office nearest you. Many visitors to Mexico plan a car rental for at least a portion of their vacation. Although renting a car is generally not necessary in most Mexican resorts, they can be nice to have for a day or two to explore the town and surrounding areas. The longer you want to rent a car the more it makes sense to plan ahead. A good idea is to make a reservation at least two weeks before you head to Mexico. Obtaining a written receipt (faxed or e-mail) will be helpful when you arrive at your destination. Most car rental companies will let you reserve a car without a deposit or a credit card charge. Don't be surprised if the nice person at the car rental counter at your destination has no record of your reservation. Things like that happen in Mexico! If this should happen, providing your written receipt should help you obtain a rental car at a rate similar to your reservation rate. If you are looking for the absolute lowest car rental rate, try this technique. Reserve the car at home two weeks before you got to Mexico, and bring along your receipt. This is now your worst case rate. When you get to the airport car rental counter, start shopping between the 2 or 3 different companies. You might be surprised how the different companies will discount their rates to get your business. The rate you end up with will often be less than the rate on the reservation form that you brought from home! Remember, most rental companies in Mexico offer unlimited mileage, so get creative with your possible excursions! The good news is that U.S. dollars are accepted almost everywhere in Mexico. Exchanging dollars for pesos is generally not necessary, unless you like the idea of packing some foreign currency. The bad news is that many of the vendors and service people are unable to handle large U.S. currency. Even a $20 bill can be tough for some of these folks! Got a $50 or a $100 dollar bill? You might as well be broke. The solution to this is simple. Before you leave home, stop on by your favorite bank and load up on $1's, $5's and $10's. This way you are ready to purchase whatever catches your fancy, without the glassy-eyed stare of the vendor when you try to pass him that $20 dollar bill! If you think you will be making a few phone calls from Mexico to the folks or clients back home, a little planning will go a long way. Although most of the larger hotels have pretty good telephone service, they usually charge a fee for each time you use the phone. If you are making a lot of calls, those fees can add up. Probably the best way to make calls from Mexico is to use one of the public telephones, such as Telmex or Telnor. These phones only work if you insert a pre-paid phone card, but you can usually get a card for about 5 bucks ($50 pesos) and they are good almost forever. After inserting the pre-paid phone card to get a dial tone, your goal is to hook-up with your long distance carrier back at home. For most people this is AT&T or Sprint. So before you leave home it is important to contact your long distance carrier to obtain your calling card number, as well as the phone number to access your carrier. For AT&T the access number is usually 001-800-462-4240. Now, when you call your carrier from the public phone in Mexico you will hear that familiar female voice say "thank you for using AT&T". From this point you can dial the area code and number you want, followed by your calling card number. It's that easy! And the rates you are charged are usually pretty competitive. The weather in Mexico is nice pretty much all year long. From June through September the possibility of rain increases in the late afternoon, but these showers usually only last for an hour or two (and make for some great sunsets!). But whenever you travel to Mexico it is a good idea to get a head's up on the current weather, just so you know what to expect for your first day in town. If you happen to hit a bit of bad weather the day you arrive, chances are good that it will be a beautiful day tomorrow. Major weather systems, however, are a sombrero of a different color. During the summer Mexico occasionally has Chubascos, which are just like hurricanes only spelled different. Chubascos rarely come without warning, they tend to build from tropical depressions out at sea and then into tropical storms. They show up very well on weather radar, so you can usually tell if one is heading towards your destination. Not that you necessarily want to cancel your vacation because of one, but you might want to plan on a day or two of down time. For more information on the current weather in most of Mexico's popular destinations check out the WEATHER section of Mexico Expo. You go on vacation to relax, right? But it can be hard to completely relax if you are out on the town with you wallet or purse on you, full of cash and credit cards. Do yourself a favor! Before you depart on your trip to Mexico, establish a separate wallet or stash bag that you can use while wandering around after you check into your hotel. You can leave the bulk of your cash, credit cards and important documents in a secure place in your room or in the hotel safe, and then bring what you will need for the day's outing in the separate tote bag you brought from home. This is also a good place to stash a pen and paper for taking notes, and your long distance telephone carrier information if you are planning on making a few phone calls. It never hurts to include a few business cards, in case you want to keep in touch with some of the nice people you meet while you are out and about in Paradise! Each year more and more airlines try to compete for your business by trying to offer you better service. I say keep the extra peanuts and give me a direct flight! If there is one way to get your vacation off to a slow start, it's changing planes and killing time waiting for the connecting flight to your actual destination. Yes, direct flights are more expensive, but hey...this is your vacation and you are worth it! The one exception to this rule is if you really want to check out the stopover location. Spending 5 hours in Mexico City or Los Angeles can be a good idea if you have planned this stop in advance. There can be lots to see and do in many stopover cities, and this can be a "value added" perk in your vacation itinerary. They key here is to plan ahead. The vast majority of travelers to Mexico let their seating assignment up to the random choices of the airline contact person. And these are the same people who would just love to accommodate a specific seating request if the passengers would just ask. Your preferences? For a more quiet environment (not to mention getting served first for food and beverages!) the front of the plane is the hot tip. Keep in mind that the very front of the plane (known as bulkhead) can be private, but is a little shy on leg room because there are no seats in front of you to tuck your feet. The downside of being in the front? If you are girl watching you won't see much isle traffic if you are sitting in the front. Window or isle? Carlos Fiesta's tack on this is simple. Vacations are a journey as much as they are a destination. Getting a window seat should cost more, but it doesn't. So if you have any interest in viewing the new terrain and beautiful coastline below you, a window seat is a great value. If you are tall or big, you might want to consider an isle seat, which can give you a bit more room to stretch out, and has the added luxury of putting you closer to the food cart in case you need to steal more peanuts! The time to request a specific area of seating is when you first make your reservations. If, for some reason, they are unable to accommodate you at that time, try again when you receive your boarding pass at the airline terminal. This Travel Tip is definitely not critical, but it can be a ton of fun. The people who serve you in Mexico are also serving thousands of other tourists, but they rarely receive any special recognition from us visitors for their efforts. Sometimes it can be fun to bring down small items to give to these people, especially if they provide you with excellent service. Items they enjoy include nice pens, pocket calendars, key chains and other trinkets that easily fit into your luggage. These types of gifts are good for someone who has helped you at the front desk of the hotel, or maybe gone out of their way at a restaurant or at an event that you attended. Of course the kids like candy, small toys, decals other items, and if they clean your windshield do some other favor for you these types of items are usually appreciated. It's easy to be a typical tourist, but with a little extra effort you can be a very special person, and maybe even make a new friend. I'll never forget my first trip to England. We rented a car, drove all over southern England, and when I got home two weeks later I realized I had driven within 15 miles of Stonehenge without even knowing it. Lesson? Sometimes there are some awesome things to see that are just a short drive away from the main location you are staying in. But it takes a little planning to get things set up. The fine line you don't want to cross here is to let the possible excursions get in the way of your original plans for the trip. Your excursions should be just that...an adventure from your main destination to something really neat close by. It can be easy to get carried away with excursions, especially in a country as awesome as Mexico. 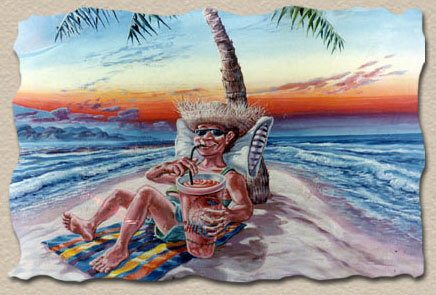 A good excursion might be several days after you have had a chance to wind down, and become one with that Pina Colada. Then, when you are getting just a tad antsy, hop in that rental car and see what's out there! Chances are good that you won't be back in this location for a while, so if there are any interesting sites to see nearby, this is the time to see them. Another fun Travel Tip! Just because you don't have to know any Spanish to enjoy Mexico doesn't mean you shouldn't. Learning 10 or 15 key Spanish words sets you out from the crowd, and the local people love it when you try to meet them halfway (no matter how badly you butcher their language!). Most people who have fun with the language end up speaking a language we call "Spanglish". Spanglish is usually a good hearted attempt to speak basic Spanish, with a little English sprinkled around to fill in the gaps. Mexicans don't seem to have much of a problem understanding Spanglish, and it's fun trying to communicate with them as far as your talents will take you! A good starting point for learning Spanish is to obtain one of those very small language books at the bookstore or airport. Remember, the goal here is not to really learn the entire Spanish language complete with it's conjugated verbs, your are just looking for a few key words and phrases to brush up on for your Vacation Spanish. Buenas Suerte! The real satisfaction of learning some Spanish is when you get home. Seems more and more people working in the U.S. speak Spanish in everything from construction work to restaurants. So don't stop your new found talents when you get home...try a few words with your waiter when you go out and order Mexican food! Okay, you've set up most of the important elements of your trip. You've got the 'big chunks' handled. Don't stop now...here are a few Hot Tips to consider while en route! When you purchased your airline ticket to go to Mexico they probably told you to get to the airport 2 hours before the flight departure time. Yes that does seem a bit extreme, and often when you get there 2 hours early you find that you are the only one in line. So is it really that important to get to the airport 2 hours early? It depends on a few factors, most importantly how full the flight is. Like many U.S. flights, some Mexican flights are overbooked. As a percentage, the chances of being overbooked on a U.S. domestic flight is much greater than on a flight to Mexico. But the possibility exists, and your vacation is just too darn important to take a chance. The folks at the airlines can be a bit coy about letting you know if your flight is sold out or not when you call to ask. But, after a bit of prying, if you discover that it is indeed sold out, this is your head's up to definitely get to the airport early. When a Mexican flight is overbooked, the airlines will often ask for volunteers to take a later flight. They may even compensate the cooperating party with a nominal amount of money. That may be fine for business passengers or people with no life, but you are on a mission to have fun, and the last thing you want to do on your vacation is hang around the airport. So the closer you are to the front of the line, the better your chances are of getting that all important boarding pass and seat assignment, and a flight to paradise. Getting to the airport 2 hours early is usually less critical on your return flight. Yes, it is still possible that the flight might be overbooked, but even if you get there an hour early you will still probably be ahead of the rest of the folks on the flight who are still shopping for souvenirs and getting the sand out of their snorkels. Getting to the airport early is important only if you really have to go home. It can actually be fun to call the wife and the boss and say you are stuck for an extra day! They won't believe you, but it is fun. Trust me...I've done it! People are what make trips to Mexico great. Yes the weather is wonderful and the destinations are beautiful, but it is the people you meet along the way that really add the color to your trip. Why not get started early? It can be fun to get a conversation started while in line at the airline ticket counter, or while waiting to board the plane at the departure gate. It's usually pretty easy to get a conversation started, and you might be surprised how most people open up when they are getting ready to go on vacation. Look for items that can help trigger a question to a fellow traveler, such as fishing poles, scuba equipment or surfboards. A great way to get a conversation going is to comment on someone's T-shirt. Most of the shirts people wear to the airport are worn intentionally, and usually to make note of a hobby, place or event that can help spark a great conversation. Once you get the hang of this art of meeting people, don't stop when you get off the plane. All throughout your vacation you can add miles of depth to your trip by talking to other travelers and the local people. It's a great way to add flavor to your Mexico getaway! This is a big one. Aside from your return airline ticket, nothing is more important to keep track of than your Passport and your Tourist Card. Why? Because you can't go home without them. Okay, you will probably get home eventually without these papers, but it won't be on the same plane as your friends and family. After you pass through Immigration in Mexico you will probably not need your Passport and Tourist Card again until you get back to the airport to go home. So before you even leave the airport, take the time to stash these items in a safe place that you will remember when you are back at the airport at the end of your vacation. If you do your vacation right, this will seem like a year later because of all the fun you had while at your destination. So make a very special mental note where you have placed these items. To keep things really simple place your return air ticket and your Tourist Card inside your Passport and wrap a rubber band around it. Then place it in your special place. Now you can enjoy your vacation completely without giving your valuable papers a second thought! At most Mexican airports there are two common ways to get from the airport to the hotel zone. For those on a budget the "collectivo" vans are an inexpensive way to get to the hotel. For something like $5-$7 U.S. per person you can utilize this service if you are not in a hurry. The down side to these vans is that you have to wait while they try to fill the van, and then you have to be patient while the van stops and drops off passengers at the other hotels on the way to your hotel. If you are not in a hurry this can be an interesting way to check out some of the other hotels in town. For those who want to spend a little more money and wait less, most Mexican airports have taxi cabs waiting out front. The good news is that you can jump in and go directly to your hotel, with no stops on the way. The cost of this convenience is usually $25 to $30 U.S. Probably the best way to get to town is to find another party who will split the cost of a taxi with you. By law Mexican taxis can take on 5 passengers, but even with 4 passengers the cost gets amortized to a pretty affordable rate. You've arrived in Paradise! Here are a few hot tips to help you make the most of your Mexico adventure! One of the biggest bummers that set Mexico visitors back a notch or two is getting a bad sunburn. This usually happens during the first part of the trip, and can adversely affect an otherwise great vacation. Although this can be a problem for almost any visitor, it can be a particularly serious problem for people who are not used to spending a lot of time in extreme sun conditions. The amount of sun you receive on a vacation in Mexico is almost certainly more than you normally receive, for three different reasons. Numero uno... you will probably be spending more time outdoors while on vacation in Mexico than you normally do at home. Numero dos...even if you spend a fair amount of time outdoors at home, the sun exposure you get is probably not tropical sun. The sun becomes more intense as you head towards the equator, and most of Mexico is in the tropics. Numero tres...is our friend Mr. Reflection. Sun reflecting off the sand and off the water can double the amount of sun you are exposed to, making the need for adequate sunscreen even more important. The most effective solution to this problem is to making sunscreen application a regular part of your morning routine, right up there with brushing your teeth. A good layer of sunscreen in the morning will usually last you all day. If you are planning on spending any amount of time in the pool or ocean, a good waterproof sunscreen is the perfect solution. Carlos Fiesta recommends Bullfrog waterproof sunscreen...it's awesome! If your like most people who travel to Mexico, you brought along plenty of cash and credit cards to be able to have a good trip. Mexico is a very accommodating country, so no matter how much or how little money you brought along, you can have a good time. But one thing you don't want to do is to bring all of your cash and cards along with you on each day's outing. It can be too easy to loose your wallet or purse while you are in this fun and relaxed environment. A good idea to to leave the majority of your cash and cards secure at your hotel, and to head out for the day with sufficient cash (and maybe one credit card) to pay for the day's needs. Whether you choose to bring along a separate wallet or tote bag for your day out, or whether you choose to bring your regular wallet or purse stripped of the items you don't want to lose, the idea is the same. Minimize your exposure to loss. Mexico as a country is no more dangerous than most other countries. As a general rule, you'll find that just like the United States, the larger the city the more likely you are to experience crime. In some of the small villages in Mexico crime is almost unheard of. And in some of the large cities like Mexico City, a challenging economy has been an excuse for some of the local people to get what they can by whatever means possible. Not unlike New York City. In my 25 years of traveling Mexico I have never had an experience with theft, although I have had too many margaritas on occasion and stupidly lost my wallet. But I can't blame Mexico on that! This may seem like a pretty silly rule, especially if you are staying in a nice hotel. And occasionally eating a meal in your hotel is justified. The idea here is to get out of your hotel and immerse yourself into the local culture. Much of the flavor to be enjoyed in Mexico is from walking the streets, checking out the local fare, and just being out there. It can be too easy to roll out of bed, slip downstairs to the hotel restaurant for breakfast and a coffee, and then head out to the pool for a nap. You could do that at the Holiday Inn in St. Louis. (Not that there is anything wrong with that). But before you know it you will be home again, back to your normal routine, and you will not even have the option to check out that little seaside palapa with the sand floor and parrot in the corner. Do it while you can! By the way, if you think you can get around this rule by eating at the local Mexican franchise of Mc Donalds or Pizza Hut...forget it. You're better off eating at your hotel. First time travelers to Mexico are sometimes confused by the cost of items and services that are priced in pesos. This is a pretty easy issue to figure out and it becomes fun to refine after you get the basics down. Your first goal is to convert the general cost of the item from pesos to U.S. dollars. You can nail down the exact conversion later. And since the value of the peso has roughly been 10 to 1 for the last few years, it makes it easy for us to get close. Basically all you need to do is to divide the cost of the item priced in pesos by 10 to get you the price in U.S. dollars. As an example, an item that costs $250 pesos you can determine that the cost in dollars is somewhere around $25 U.S. A service that is priced in pesos at $1,500 will run you about $150 U.S. dollars. This formula gets a tiny bit out of whack when the ratio of the peso to the dollar gets away from the 10 to 1 numbers. Although the ratio changes every day, it is usually somewhat stable over long periods of time. As an example, if the peso becomes stronger, the ratio might drop to 9 to 1. You can still use the easy-to -formulate 10 to 1 ratio, but remember that you will end up a little light on the dollar side. So at the 9 to 1 exchange rate, an item priced at $750 pesos might actually cost you closer to $80 U.S. dollars. As you can see the 10 to 1 rule gets you close, but no cigar. For the cigar you will need a calculator. Aside from prices, there are other numbers you may want to figure out when traveling around Mexico. Like speed limits and miles to the next city. If you are not keen on kilometers, and want to convert to miles we can help. The basic formula here is to multiply times 6. If you want to get even closer you would multiply times 6.2 but hey, you're on vacation so we're going to keep your math as simple as possible. So let say you see a sign that says Puerto Vallarta is 100 km away. All you need to do is to multiple 100 kilometers times 6 and then drop a zero. So a destination that is 100 kilometers away is only about 60 miles away (100 X 6 then drop the zero). This fun formula will also help you with speed limits. If the sign says the speed limit is 60 km per hour, multiply by 6 (and drop the zero) and you get about 36 miles per hour. You can also impress your friends and meet girls with these magic formulas! Never underestimate the power of knowledge. No man (or woman) is an island. But sometimes when you are on vacation and just want to get away from it all you may not be too excited about striking up a conversation with somebody you don't even know. Reconsider. Half the fun of any vacation to Mexico can be the people you meet, both tourists and locals. But these meetings usually don't take place without at least some effort. There are many opportunities to meet people while traveling in Mexico, just keep your eyes open. The folks in the restaurant at the next table, the guy trying to figure out how to work his mask and snorkel down by the water, or the local chef fixing up a fresh batch of fish tacos for your lunch. They've all got lots to say, and some of it is pretty darn interesting. All you have to do is open the conversation door, and they will probably jump right in. Obviously some of the people you will run into have absolutely zero interest in yacking with you. It doesn't take very long to figure this out. Some people just want to be left along and to relax...you might be one of them. But when the time comes where you do want to spice up the conversation, don't be shy. You might be surprised what you can stir up! Every country has different ideas on tipping, and Mexico has it's own informal set of rules. Tipping is definitely an accepted practice in Mexico, and in many cases it is expected. So following a few general guidelines can help smooth the process. Unlike the United States where tipping is often 20% of the bill amount, tipping in Mexico is often done on a smaller scale. Generally speaking, a tip of 10% is standard in Mexico, although there are times when tipping more or less may be justified. A good example of leaving a larger tip might be an evening out at a restaurant. If the waiter went way out of his way to make your dinner a spectacular event, you know he will appreciate a tip larger than 10%. It is even likely that he worked extra hard with the hopes that you would recognize his efforts with a tip. If the service you received was a largely responsible for your great time, a bigger tip is a great way to express your appreciation. On the other side of the coin (pun intended) tipping for lousy service is not recommended. Tipping out of habit sends a message to the server that bad service will be rewarded, and that there is no reason to provide good service. Bad service deserves a bad tip. Although taxi drivers do not generally expect much of a tip, if your taxi driver helped you with general questions about the area or provided you with some inside information, a tip is a great way to show your appreciation. Porters that help carry your bag from the airport to your transportation, or to your hotel room also deserve a tip. Giving a dollar for 2 or 3 bags is acceptable, maybe a little more if you have a lot of luggage. Travelers to Mexico who need to make phone calls usually benefit from a little planning ahead. If the telephone in the hotel room is the most likely telephone you will be using, it's good to know up front how much the hotel charges you to use the phone in your room. This per call charge can be as little as 50 cents per call, or as much as a couple of dollars per call. Since the telephone in your room is so convenient, and the quality of the connection is usually pretty good, it may be worth it to use this phone. If the cost seems too high, you have other options. There are public telephones located throughout most towns and cities in Mexico, and they are quiet easy to use. It's best to use these phones in conjunction with your long distance carriers back at home, such as AT&T or Sprint. This will help you get a better rate. But it is important to have your calling card number when you make these calls, along with the phone number to call to access your long distance carrier. To access AT&T the access number is 001-800-462-4240. Unlike most telephones in the U.S., Mexican telephones do not work with coins. You will need to purchase a telephone card at a local market, usually for about $5 U.S. These phone cards work great, and if you are making a call through your long distance carrier, these telephone access cards are not debited for the time you are talking. So theoretically they can be used over and over for years. A third way to make calls from Mexico is from the privately owned "Larga Distancia" Long Distance telephone shops located in most cities. These telephone stores are usually located inside a pharmacy or another small store. You simply give the number you want to contact to the person at the counter, and they will connect you. The phone you will use is usually against the wall, away from the counter, with a number on it ("1" or "2" or "3" etc.) Your call is usually timed by a stop watch, and the rate is about $1.65 U.S. per minute. They will usually accept pesos and smaller denomination U.S. dollars. Many of the public areas in Mexico such as beaches, streets and the areas in front of restaurants are utilized by the local people to sell their goods. They are either selling small locally made items or timeshares. If you are traveling and you did not get approached by vendors during your stay, you probably got off the plane in the wrong country. Vendors add a lot of color to Mexico and most offer a good service. But if you want to make the best of your vacation, it is important to know how to control these unsolicited encounters. When approached for the first time you may actually want to look at the items that the vendor has for sale. This can be fun, and taking home a few souvenirs is a great way to put a smile on a face back home. But remember, the vendors approaching you don't know if you just arrived in town today, or have been there for a week. These folks are on auto-pilot..."Good deal for you...almost free" is like saying hello. They say it all day and after you move on they will say it again to the next person. It's their job. So if you are not interested in what they are selling it is best to avoid eye contact, say "no thank you" and keep walking. It's that simple! People selling timeshares are a bit more of a challenge. First off let me say these folks do provide a legitimate service, and they are usually very nice people. But their desire to get you signed up for a "free" breakfast is much greater than their desire to help you maximize your vacation time. With these chance rendezvous the item they want from you is your time, the exact item you are is shortest supply of while on vacation! So a few suggestions will help you stay on track. First, if you really are considering buying a timeshare, don't buy it on your first trip to the destination in question. If you love the place that much you'll probably be back again soon, and you can look at timeshares on the next trip down. Secondly, if you have no interest in buying a timeshare, follow the same rules that you follow for vendors...avoid eye contact, say "no thank you" and keep moving. It can be a bit harder to follow these rules with the people who sell timeshares, because they are usually much more persistent and good looking. Nevertheless, remember you are on vacation to relax and enjoy yourself, not to buy another home. Driving a car can be a wonderful way to explore Mexico. And a few driving tips will help make that drive even more enjoyable. Whether you are renting a car, or driving down in your own vehicle, these tips will help. 1). Watch for slow moving vehicles at all times. The Mexican people use the same roads that the tourists use, only they are usually going a lot slower. 2). Watch for animals on the road. Cows, horses, mules, goats and dogs all wander around on the pavement. Be particularly careful on curves and at night. 3). Be prepared to pass other vehicles. If the slower moving truck in front of you has his left blinker on, he is probably telling you to go head and pass him. 4). Understand road workers hand signals. When these guys are standing on the side of the road "pushing down" with their hands it means "slow down" for what's ahead. 5). Understand the speed limit signs. Using the "times 6" rule, multiply the kilometers per hour times 6 and then drop the zero. 100 kph roughly equals 60 mph. 6). Comply with insurance requirements. You are not required to have damage insurance for your vehicle, but you must have liability insurance in case you are in an accident. 7). Drinking under the influence is against the law. When partying in Mexico find somebody who is sober to get behind the wheel of the car. The Mexican jails are scary. 8). Enjoy the journey! Bring along music, cold drinks and snacks! Road trips in Mexico are more than just a destination...they are an adventure unto themselves. Enjoy! Shopping can be a fun part of any trip to Mexico. Some people travel to Mexico with shopping as their main purpose for going! Indeed Mexico offers a huge variety of items both in the local shops and from the vendors walking the city streets, and the prices are hard to beat. There are certain times on your vacation when shopping makes more sense. Seasoned travelers often wait until the last few days of a vacation to wrap up their shopping (pun intended). The very last day of a vacation can be a great time to shop, especially if you have time to kill between hotel check-out time and the time you need to head to the airport to depart. Shopping on the last day also gives you the added convenience to know how much money you have left for shopping. As long as you have enough money to get your car out of the airport parking lot back home, this is your chance to shoot the wad. Last minute shoppers will appreciate the shops at the departure airport, prior to getting on the plane. Prices at these shops may not be as cheap as some of the smaller tiendas back in town or on the beach, but can you think of a better way to burn time while waiting to board the plane? If you get the airport an hour or so early to get checked in, cruising the airport shops like a mall rat might just be the best use of your time. It's either that or have another margarita at the airport bar!